The following post was written by Kim Syman, Managing Partner, Field Leadership and Early Learning Fund. The conversation, and the full #OpportunityRedefined series, build on dialogue that these and other leaders started at New Profit’s annual Gathering of Leaders, where we explored what it means to be on a path to opportunity in America today. Since then, issues of race, and inequality of justice and opportunity, have remained atop the national agenda due to the tragic shootings in Charleston (see my colleague Vanessa Kirsch’s response to that event here) and other events. For the social innovation field, the ties are ever clearer between our work and what unfolds daily in communities across the nation, and the time for listening harder, speaking out more boldly, and taking concrete action is long overdue. Here at New Profit, we’ve become more conscious of the ways in which we are bearers of this responsibility, and we are responding in a few ways initially: we’ve launched an internal working group to explore how race, diversity, and inclusion play out in our investment strategy, organization culture, collaborations with philanthropists, efforts to recruit talent, and the way we form our firm’s aspirations and make choices about our strategy. We’ve also added three new people of color onto our Board of Directors (to read the full announcements click here and here) over the last year. We have a long way to go, but our team is embracing the challenge at hand. We have to acknowledge our own biases to make progress. In order to advance racial equity, we need to recognize the implicit, unconscious biases inherent in ourselves as leaders and shapers of the social innovation movement, not an easy thing to do in a sector that ostensibly has equity and social justice at its core. The work of people like Mahzarin Banaji and Anthony Greenwald (authors of “The Blind Spot”), Claude Steele (author of “Whistling Vivaldi”), and many others can help us get started here. We have to confront those biases and the way they play out in our organizations – social change models, organization strategies and structures, leadership teams, etc. – and see where we can make shifts. Ways in which to do this include diversifying organizational leadership, bringing in external facilitators to inventory attitudes and realities and diversity and inclusion and to support open and frank conversations about race with the organization’s staff, board, constituents, and funders, as a starting point. Other ideas from Alex Bernadotte and Kirsten Lodal for how to do this came up in our Google Hangout. Networks and relationships are drivers of opportunity that are just as essential as hard skills. As believed and proven by LIFT, having strong networks and relationships help people get ahead and stay ahead. As such, it is important to have these subjective and relational factors included as part of the dialogue of social problem solving. The energy of young people speaking out on the role of race in our nation is palpable and powerful. Technology has provided a new generation of children and young adults with a radically different social context in which to develop and play out their own identities, and unprecedented platforms to connect to each other and mobilize around issues they care about. And, of course, they are our nation’s future. To create the changes that we seek, we should focus more on how we help to empower and prepare them to carry the nation forward, not only through their educational opportunities in a traditional sense, but through their access to and ability to effectively use media and culture to transfer knowledge. In our Google Hangout, Maria Teresa Kumar gave us multiple examples of the power of this approach through Voto Latino. Conversations about race and diversity need to be purposely catalyzed among philanthropists. Discussions between grantees and funders, and among philanthropists, have started to happen, but there is still a lot of work to do for these kinds of conversations to occur with authenticity, broadly, and with a sense that they are not just “on trend” but of consequence for defining and achieving funders’ – and social sector organizations’ – goals and aspirations. Diversifying donor networks themselves is also essential in making sure that organizations’ diversity and inclusion lens is applied roundly, which will in-turn provide more opportunities for organizations to press into this work. Change is possible, but only when you talk about the hard stuff. There is a deafening silence within the direct service community and the nonprofit sector as a whole. It is critical that leaders, both white and of-color, speak out to create a safe space to discuss these issues. Within your own sphere of influence, whatever the patterns you are recognizing around race, say something and do something. My hope is that this social entrepreneur-led conversation will help others to think about problem solving in America in fresh ways, and will foster boldness and additional collaboration to tackle some of the thorniest challenges that hold us back. The next installment of our #OpportunityRedefined series will focus on how recent findings and advances in behavioral science are changing problem solving in America. We will highlight, among other things, how insights from cutting-edge research on the forces that drive the development of children’s brains can strengthen our current strategies, service delivery models and policy efforts.We would love to hear your thoughts. 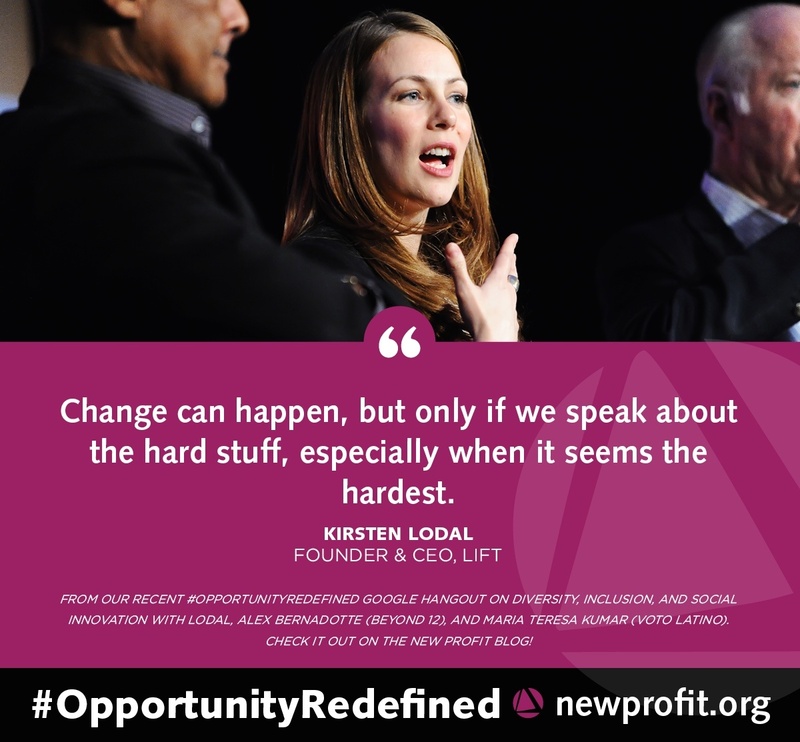 Please join us in continuing this conversation by following us on twitter @newprofit with the hashtag #OpportunityRedefined.